The Spanish Supreme Court has allowed the fascist party, the Falange, to join a private prosecution brought against Judge Baltazar Garzón because of his attempts to investigate the crimes of the Franco dictatorship. The Falange, which was the sole political organisation allowed under the regime, carried out countless crimes against the Spanish working class during the civil war (1936-1939) and the dictatorship afterwards. Today it has a tiny membership. Garzón, who is a member of the highest criminal court of Spain, the Audiencia Nacional, has become well known internationally for his controversial investigative activities. In 1999 he attempted to extradite Chilean dictator Augusto Pinochet from Britain in order to try him in Spain for genocide, terrorism and torture. He has investigated the actions of the Basque separatist organization ETA as well as the anti-ETA death squads established by the Felipe González Socialist Workers Party (PSOE) government in the 1980s. Garzón was also involved in investigating corruption inside the opposition Popular Party (PP). He has been criticised recently by both the United States and Israel after he attempted to charge members of their governments with crimes against humanity―the US for its actions in Iraq, Afghanistan and Guantanamo Bay, and Israel for war crimes committed in Gaza. He also summoned Chinese government ministers to testify about the crackdown on protests in Tibet. In September 2008, Garzón started his investigations into the Franco-era killings after accepting petitions from families, grouped together in Historical Memory societies, who wanted to find the remains of their loved ones and clarify the circumstances of their deaths. As a result of his investigations Garzón accused Franco and 44 former generals and ministers, plus 10 members of the Falange, of crimes against humanity. He demanded the opening of dozens of mass graves where over 100,000 of their victims were summarily shot and buried. Garzón raised the case of the forced separation, mainly by the Falange’s Foreign Service, of an estimated 30,000 children from their parents, usually political opponents of the regime. He pointed out that the Spanish courts had never carried out a criminal investigation into any of these crimes and not a single perpetrator had been brought to justice. However, just a few weeks after issuing this damning indictment against Franco and his henchmen, the judge dropped the charges after lawyers appointed by the PSOE challenged his authority to pursue the investigation. They argued that Garzón had breached a 1977 law granting amnesty for atrocities passed as part of the so-called “peaceful transition to democracy” following Franco’s death in 1975. The PSOE’s action marked a significant capitulation to opposition to Garzón from the Popular Party opposition, which originated in the Falange, the Catholic Church and the media. 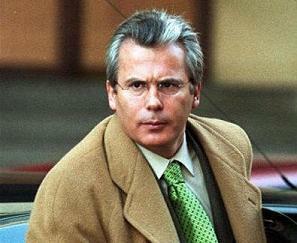 Encouraged by its actions, two newly formed extreme-right organisations, Manos Limpias (Clean Hands) and Libertad e Identidad (Freedom and Identity), launched a petition for Garzón’s prosecution on charges of “corruption in the performance of his functions,” which was accepted by the courts. If indicted, Garzón would be immediately suspended pending trial. The action against Garzón is a clear sign that the ruling elite is determined to intimidate anyone who attempts to question the “pact of silence” about Francoist crimes agreed by the right wing, the PSOE and Communist Party (PCE) during the transition. Many of today’s ruling elite and top officials are direct heirs of the Franco regime. Not only is Garzón in the dock, but the people who asked him to initiate an investigation are being put at risk. The court has made available the documents presented by the historical memory associations regarding thousands of victims of the dictatorship to those attempting this prosecution―including now the Falange. An investigation into the crimes of the fascist regime would expose the role of the so-called “transition to democracy,” which preserved capitalist rule in Spain after Franco’s death and prevented any settling of accounts with the fascists. For 35 years, every attempt to uncover what took place has been frustrated. Involved in the prosecution of Garzón is the fear that such an investigation of the past will become a catalyst for a new eruption of the class struggle and of a political struggle against the existing order, especially given growing economic and political discontent. A group of leading writers, lawyers, academics and musicians signed a manifesto of support for the judge and declared they were “sadly convinced” that he will suffer a “Kafkaesque” trial. Letters to El Pais expressed support for a political and judicial accounting with the Francoists.